Another of the ‘pea flowers’, Polygala x dalmaisiana with its lush green foliage and brilliant purple flowers will reach around 1.5m in height with a similar spread. 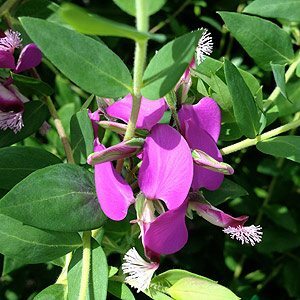 Sometimes called the ‘sweet pea shrub’ as its purple flowers resemble sweet pea flowers. This is a more compact, or smaller growing plant than the species, Polygala Grandiflora. Evergreen and flowering from spring through summer this is a hardy plant that requires little attention once it is established. Best is a sunny warm position Polygala x dalmaisiana is a remarkably hardy plant. In containers use a good quality potting mix, in the garden grow in a humus rich moist but well drained soil. Water in with a liquid seaweed fertilizer. An application of general purpose slow release fertilizer in early spring and again in early summer seems adequate. Water regularly through the first summer and lightly mulch around the plants to maintain some moisture and help suppress weeds. Plants can be easily pruned back after the first flush of flowers to help maintain a bush habit. Flowering period – Spring through summer into autumn. Reasonably drought tolerant once established.